I was minding my own business, really I was! Eating veggies and salads like a good girl and trying to stay away from those luscious chocolate chip cookies (sadly not succeeding much)! Along came Poorna of Presented by P flashing photos of her Bacon and Mushroom Risotto and being gleeful about how yummy it tasted. We had a long chat about risottos, cheeses, mushrooms and other edible treats. Of course the glutton in me reared her ugly head demanding a hearty risotto. Little shamefaced confession I gave in without much fight. Made a creamy, cheesy risotto for Friday night. True to her roots, this humble Bengali has a deep love for rice. So I naturally got attracted to risotto and paella. Both are rice based, yet so very exotic and different. 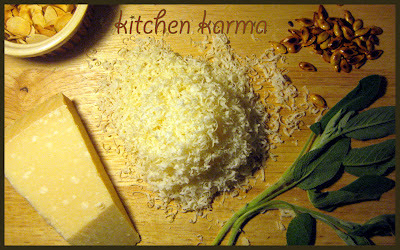 The idea of cooking rice with cheese awed me when I first discovered risotto. I took to it like duck to water and never came ashore. I make various kinds. Presenting my favourite--Roasted Butternut Squash and Sage Risotto. I was not at all fond of the butternut squash. One day it arrived, uninvited, in our organic veggie box. Initially I thought about chucking it in the bin but my conscience revolted. Reluctantly I consigned to the idea of making something with it. It turned out that with a little bit of love, herbs and roasting butternut squash can taste amazing. No longer is the squash unwelcome in my kitchen! The zealous convert that I am, now I keep buying this squash to make the risotto. After making risottos with various ingredients-- mushrooms, leeks, seafood, chicken and bacon, the butternut squash one tops my chart. The original recipe is here. Over the trials I have made so many changes that the recipe has changed quite a lot; the method is the same. all ready to go into the risotto! The Preparation Bit: All the chopping and roasting takes about an hour or so. My husband was helping me in the kitchen, so time flew. The best bit is grating the cheese which usually husband does. He is my hero, the cheese grater, sage chopper, risotto stirrer, occasional photographer and the valiant taster! Chopped sage leaves smelling divine! Now onto the cooking bit: Preheat the oven at 150C. In a baking tray, place the butternut squash wedges, sprinkle three fourth of the sage leaves, two garlic cloves, some sea salt and pepper. Pour 2 table spoons of olive oil over the wedges, make sure all the wedges are well covered with the oil, salt, pepper. Roast this in the oven for 40 to 45 mins. Please check at intervals, because time taken by ovens varry. My oven takes about an hour for the squash to turn soft and golden brown. Once the squash has reached desired softness, switch off the oven and leave the squash inside. Once it has cooled down, scrape the flesh from the skin, smash the squash and add the remaining oil from the pan to it. Keep this warm while the rice is cooking. In a heavy bottomed pan, add the remaining olive oil, the sliced garlic, red chilly and onion. Fry till the onions turn transclusent and pink. At this point add the rice and fry some more till the rice looks pearly; takes about 2 to 3 mins. Add the white wine while stirring the rice continuously. Keep stirring till the wine evaporates. [If by now your arms have started aching from all that vigorous stirring, hold on friend, there is a whole lot more to come, but the effort is so worth it, so keep on at it :-)]. Once the wine evaporates, add the stalk slowly, a little at a time to the rice, and yes keep stirring all the while. 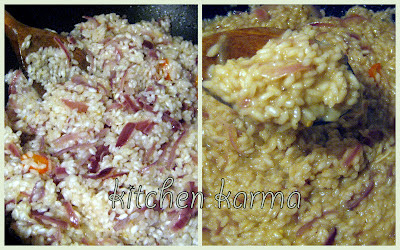 Slowly you will see the rice changing texture, releasing starch and becoming fluffy. The mixture also becomes creamier as it goes on cooking. This goes on for about 20 to 25 mins. With the last of the stalk, add the rest of the sage leaves to the rice. The sage releases its aroma and smells heavenly. When the rice is well done, switch off the gas, and slowly mix in the smashed squash and most of the cheese, sprinkle some sea salt and pepper. Leave it to rest for a couple of mins and then ladle into a plate and get ready to eat. Goes really well with a glass of chilled white wine. Garnish with cheese and I used almond slivers for my portion and the roasted squash seeds for husband's plate. (The roasted squash seeds though nice to eat on their own, did not go well with the risotto). The reason for all the fuss is because we do not like pine nuts too much. The risotto tastes a little sweet because of the squash, the red chilly adds some nice heat while the garlic adds flavour. You will find the sage to be a welcome surprise. The saying goes that sage and butternut squash are a match made in heaven. The pair did not disappoint this time round! 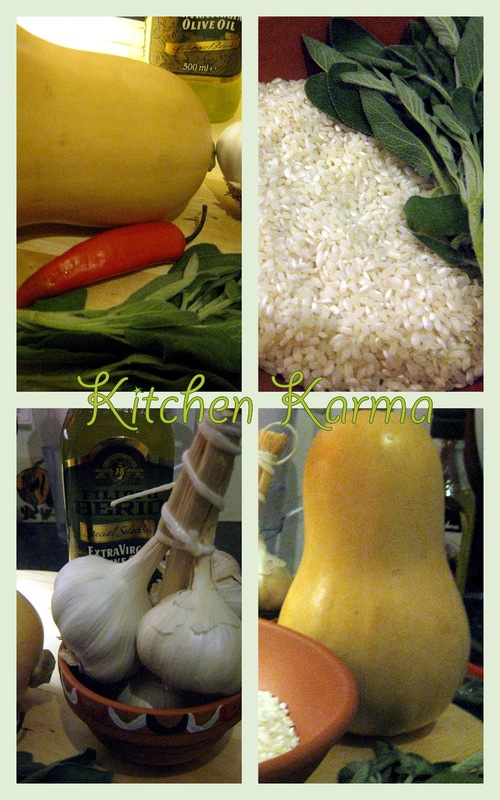 The result: un delizioso risotto! :P it seems I have started a Risotto Mania. I have made only a mushroom risotto. Nice step by step pictures. Absolutely gorgeous risotto. I've been keen on making one for a while now and this sounds too good to miss! Love the toasted seeds on top, must be a wonderful texture contrast. Also love that your husband joins you with the cooking! 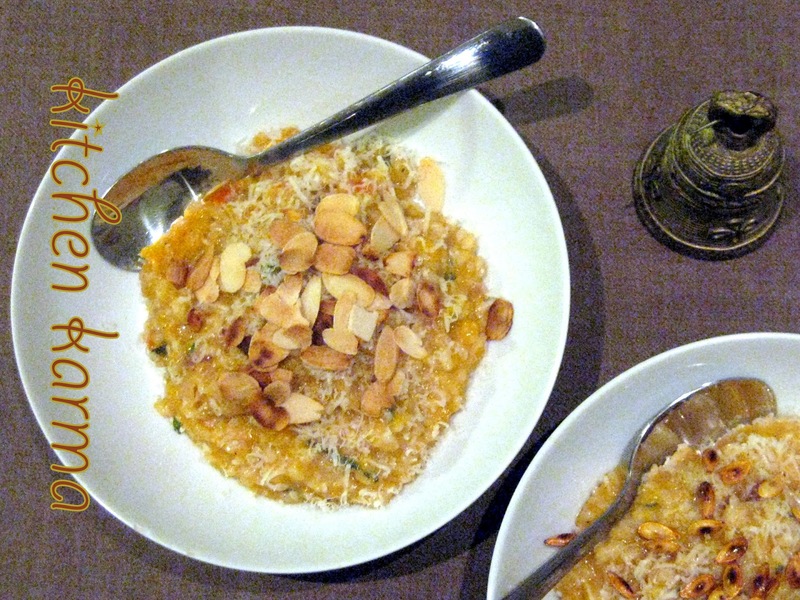 I have made this magnificent Butternut Risotto, and we all love it! Wow, delicious and full of flavor.. I've never made a risotto before, recipe that I've read were too complicated for me. But this one looks very doable, thanks for the pictures. Great post, Suchi! I just posted a comment and it disappeared... Oh, well, it happened. Great post, Suchi! I need to make more meals with rice. Thanks for visiting my blog and leaving your sweet comments!I absolutely love Risottos and this one with the squash looks so creamy and delicious!Surely a keeper! Hi Suchi, I had not eaten this but yours look delicious and tempting. I like your presentation, very nice. I love squash and pumpkin.. this risotto is perfect for me..
Mmmmm, really good, Suchi! Never tried pumpkin risotto before. 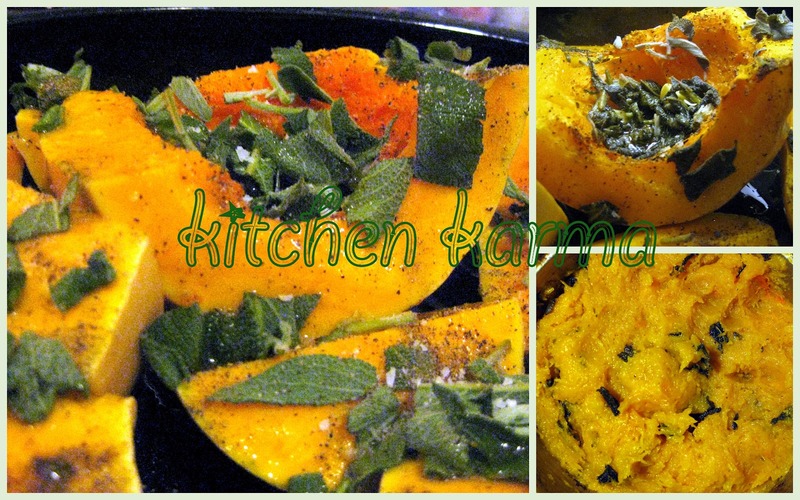 I'm sure this is delicious, I love squash and sage combination!